My kids and I have had more job charts and chore charts than I could shake a fist at. Only one of them worked very well for us: when they were four and five, I made lists of routines, jobs, rewards, and fines. We made our own paper dollars, and it worked quite nicely, but the dollars were somewhat difficult to track. Still, it was an awesome system when they were much younger. Real money worked for a while as they got older, but divorce changed everything. Disparity between their dad’s house and mine, both in finances and in family rules, has made it hard to get a consistent system going. Would I rather my children stay motivated to take care of themselves, each other, and their surroundings without any external reward system? Yes. Is that far easier said than done? Yes again. Was it working out around here? No. I couldn’t play or pay by the same rules their dad uses, so I debated what to do, and I think we’ve found a fairly good solution: our own Pebble Economy. The idea of a reward jar is hardly new or surprising. * I saw something like it in Family Fun a few years ago (love that magazine!) and I remember one of my elementary school teachers putting marbles in a jar to help the class earn a party. 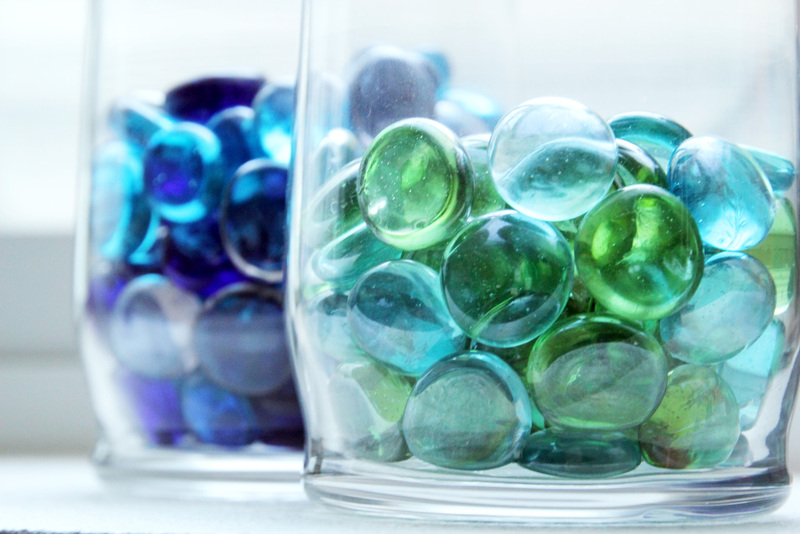 I also remember the days she took out handfuls of marbles in a seemingly bad mood, as well as the day she was so terribly impressed with our behavior that she added to our jar by nearly one third. We were conspicuously close we were to Spring Break celebrations, and I’m sure I wasn’t the only 8-year-old who’d figured out the party was scheduled whether we were good or not. Still, the marbles were beautiful, and they seemed to work anyhow. So, for my kids, I decided to take the no-nonsense predictability of the job chart they had when they were younger, and combine it with the excitement of collecting glass pebbles. I never would have guessed a nine and ten year old could get so enthused, but this has really worked well for us. This page has our official pebble economy price lists. Feel to try it out as-is; in the long run I’d encourage you to make your own to suit your families routines and needs. A few basic explanations on the routines: Care for Self references proper hygiene, care for surroundings is a matter of keeping their space clean, and care for belongings means they need to pick up and take good care of their toys, games, books, etc. Personal reading is pretty clear. Personal education? I just encourage them to learn something new or work on something that is difficult for them, or at least to go the extra mile with their homework. Personal Project is whatever they might be working on — Ethan’s programming, Mary’s experimentation with photography, etc. Oh, and we probably ought to rework the wording on the 20 point bonus. If they achieve 20 pebbles in a day, they get three extra pebbles. On the task list I think everything is fairly self-explanatory. Each of these can apply to one shared room: the kitchen, bathroom, livingroom, library, etc. A storage space that needs organization and cleaning could be a refrigerator, a bookshelf, or their craft desk. Trash/recycling duty applies to the whole house. Glass could be windows, mirrors, or picture frames. Chaos control is a combination of terms from Fly Lady’s “Can’t Have Anyone Over Syndrome” and Sonic the Hedgehog. It’s just a quick tidy up if we’ve fallen behind. I hope the rest is clear. But again, I’d recommend just making your own chart that works for you. And here’s hoping this system works as well for you as it has for us. Got other ideas for job charts and reward systems or other ways to keep kids motivated around the house (while hopefully encouraging responsibility and self-motivation?) Share away! *I feel like I have to include this after receiving a comment along the lines of “you-just-copied-this-idea-from-a-magazine-and-oughta-fess-up” on a different article — I hadn’t copied. I really do try to give credit where credit is due. In the case of the marble-jar idea, it’s been around the world dozens of times. No big deal. What I’m writing about is how we opted to implement the idea and how it worked for us. Really fun way to teach an action/reward system and keep the homestead under control. Thanks for the idea.